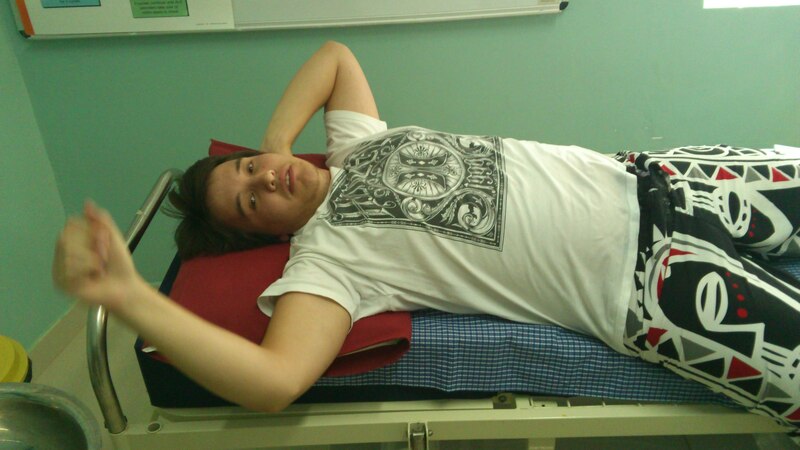 The week that was – part 2: Sea Urchins – oh the PAIN!!!!! After a delightful few days in Zanzibar, I returned home with the boys. 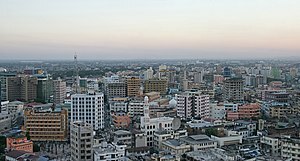 Home at this stage, being Kigamboni, Dar es Salaam. For those who have read thus far, you will know that we were initially going to settle and do the dairy farm on Zanzibar, then not, and now we are again! During the “not” part, the company decided that the best place for a farm around Dar would be Kimbiji area, just further south along the coast from Kigamboni – hence the decision to house us in Kigamboni, instead of the more “Mzungu” areas like Oysterbay or Peninsula suburbs in Dar. On one of our Sunday drives to just get out from behind the 4 walls of our property, we took a sight-seeing trip down towards Kimbiji, and found a stunning new resort, recently opened by ex-Rhodesians who lost their farm in the land-claim action by Robert Mugabe in Zimbabwe. We were so impressed that we decided to treat our boys on their visit, by spending the whole of last Sunday at the resort, planning to eat lunch and then swim in the secluded bay, perhaps some snorkelling and kayaking as well. Sunset over sea urchin infested bay! Sunday morning arrived, bright and beautiful and we eagerly set off along the coast, showing the boys a different view of Dar and it’s surrounds, instead of the polluted, congested city they had seen for the first time the day before. We drove along rolling farmlands, close to the coast, loads of palm trees, vlei lands and cattle as we went. They admired the African bush and we arrived at the resort hungry and happy. A delicious lunch and baked date and banana pudding with custard was served, which left us all full and sleepy. So with feet dragging, rather wanting to park off on the sand floor of the boma for a Sunday afternoon nap, we went down to the beach. The only visitors to the bay that day, the water beckoned invitingly. We had taken our tractor tubes with and soon we were all in the water, feeling more awake and starting to enjoy the swim. I took the opportunity to try and swim out to the reef, with Allister close by in his tube. Kobus, not a strong swimmer, chose to stay closer to shore. I was quite far out when I heard Kobus shout in pain. I looked back and he indicated that he had stepped on a Sea Urchin. I have told them about these creatures before, as I had seen them around the beaches we have been to here, and warned them to be careful of stepping on them. I had the experience of having to dig out some huge tentacles from my ex- husband’s foot when he had accidentally stepped on one during a vacation to Le Galawa Beach Resort at the Comoros some years back. Knowing how painful it must be (thankfully I have never had first-hand experience of such pain), I swam back to shore as fast as I could. 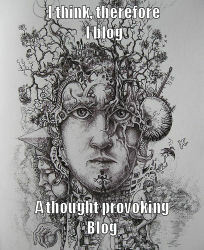 By now Kobus was sitting on the sand, clutching his foot in agony. One look at the damage, and I realised I would need to try and get it out ASAP. I sent Sakkie up to the boma to go and ask for a needle, and was still busy prodding in his foot with the fine, unfortunately unsuitable needle, when we heard Allister scream out in pain – as true as bob, he had also stepped into one after falling off his tube!!! Allister limped out, collapsing on the beach in sheer agony! At the best of times the sight of a needle is enough to make him faint, and from what I would gather from the two of them, the excruciating burn of the urchin needles would make any grown man cry. At this stage I realised this is more than I could handle and I barked instructions for us to get to the car and to a hospital immediately. Allister could barely walk, and Sakkie heroically carried him up from the beach – it helps to have strong farmer boys in the family! Now, what I have not mentioned before, is that the road to this resort is so potholed that one hops around in the car like popcorn in a popcorn machine at times. I normally drive over weekends to keep up my driving skills, but we mostly take to country roads over weekends, so thankfully my driving skills on dirt roads have actually improved – just as well, as Kobus had his spikes in his right foot and would not have been able to drive. We set off with Kobus Jnr and Sakkie on the back of the bakkie so that Allister could lie down on the back seat of the twin cab, and Kobus next to me. A trip of about 30 km took us an hour along the worst driving conditions along potholes one could want when your feet are on fire. Being a Sunday afternoon, the ferry trip to get across to the mainland was still looming, and as many Dar residents come across to our side to the pristine beaches over weekends, the ferry queue from Kigamboni to Dar on a Sunday afternoon stretches for miles, making for a very long wait – sometimes up to 4 hours long. I was not going to be deterred, and for those who know me, you would know that I do not take “no” for an answer. I zoomed right past all the cars in the queue, passing them on the right hand side with oncoming traffic dodging me or swearing at me and some even trying to block my way, but reaching the boom that allows VIP‘s or presidential entourages through normally. 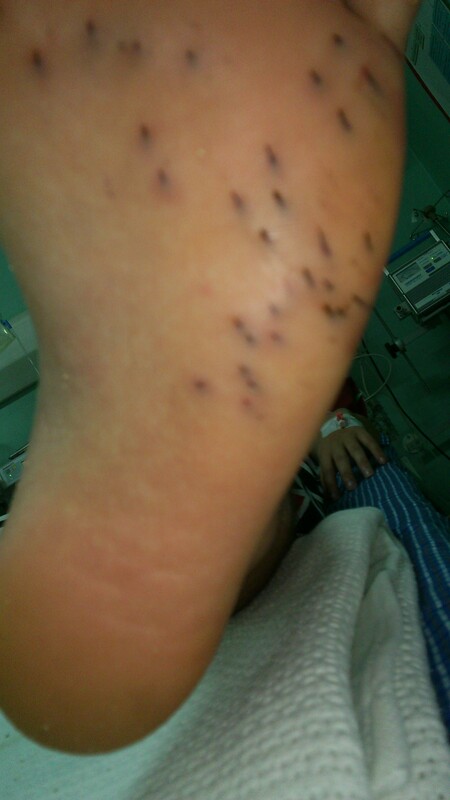 I pointed to Allister’s foot, shouting “daktari”, which means “doctor” in Swahili, and they let us through immediately. We were lucky to have a ferry pull up at that point and we boarded first. Once we reached the AMI Hospital near Slipway, the receptionist at emergency let Kobus and Allister through immediately. By now they were at least able to fake a smile, as all and sundry wanted a closer look at the feet – clearly a sight to behold! The nurinsg sister on duty dutifully prepared the tools and the lighting to enable the doctor to try and dig out the offending stinging bits, but he gave one look at this lot and admitted defeat – it was too big a job for him to try and do. The boys were then given options: general anaesthetic so that the doctor could dig unfettered, or an epidural so that they could look, but not feel the digging. Both opted for the general anaesthetic. The specialist was summoned, and whereas the accident happened around 3 pm already, he was only able to reach the hospital after 8 pm due to traffic and the fact that he had to leave a wedding. What a delightful man he turned out to be! We were apprehensive about medical care in Dar, used to more first world standards in South Africa, but I am happy to say that the hospital, the staff and the doctors – both in the emergency ward and the general ward, were of world-class standards. I was mightily impressed. The Tanzanian people are on the whole a peace-loving, gentle and delightful nation, and the medical staff were fantastic. On Monday morning I could fetch the boys from hospital, and soon after arriving there, the doctor pitched and entertained us with some of his life stories whilst the necessary paperwork was prepared for release from hospital. All in all a feel-good ending to a nasty experience. Allister commented that he will now have a story to tell of spending his first night ever in a hospital in a strange country. Poor lad still has to use crutches, more than a week later, back in Cape Town, and having to negotiate UCT campus. shame…. Apparently he has blisters on his hands from the crutches. 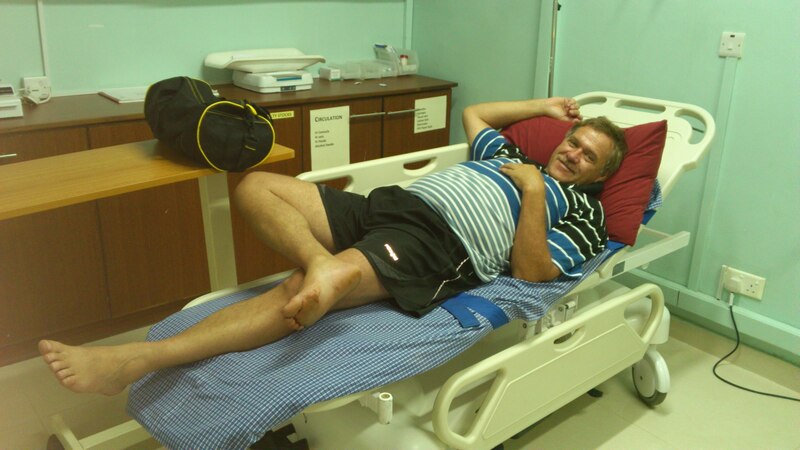 Ma’s poor heart…Kobus also complaining of the wounds being very sore, but at least more mobile. Some of the treatment advice found on the internet, or offered by the people who got to hear of the sad tale, includes soaking the foot in vinegar, which Allister did a lot, or lime juice, banging against the foot with a Coca Cola bottle or a wooden plank, to try and crush the needles inside the flesh – trying to extract them is almost futile as they simply break off every time you touch them, so digging / cutting them out or leaving them are the only options. If left inside the foot, they should be absorbed by the body soon as they are made of calcium. But o, the pain of walking on so many splinters for even a second is unbearable! Moral of the story, don’t swim in secluded areas where there is a reef too close by, without sturdy booties. A lesson well learnt. And as my friend Nicki said when she saw the picture, even if you must wear your tackies, then do so. Another friend asked on Facebook if we had gone to “Thornton”! On a final note, Kobus was invited to attend a business seminar at the swish Kilimanjaro Hotel in Dar on Thursday last week, and lo and behold, said doctor was also a guest and spotted Kobus in the crowd. He made a bee-line for Kobus and proclaimed that he is so happy to see Kobus there, and that he should stay in Tanzania (or Zanzibar then), “as we, the Tanzanian people, need all the expertise of people like you here” Kobus says about 10 ministers and business people in high places immediately circled around him, introducing themselves and asking him to tell them more about what he is here for, and countless photos then had to be taken with him in it – he came home brimming like a Cheshire Cat!!! A good result of a bad experience. Heart-warming and I am a proud wife and mama. 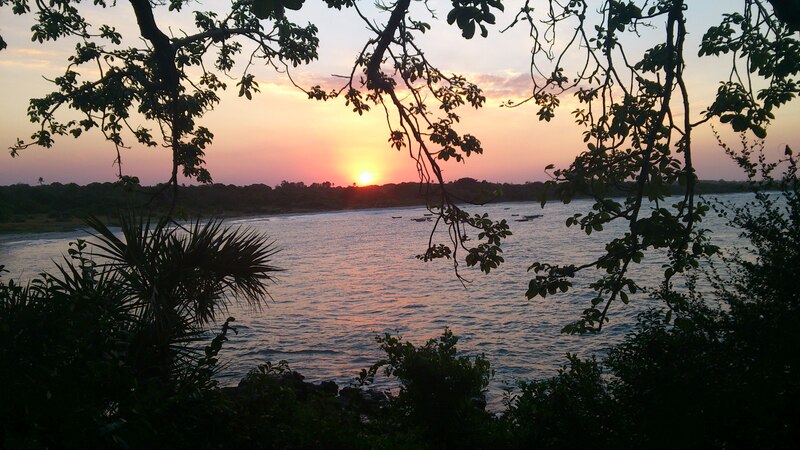 This entry was posted in Dar es Salaam and tagged Cape Town, Capetown, Cheshire Cat, Coca Cola, Comoros, Dar, Kigamboni, Kimbiji, Le Galawa, Oysterbay, Robert Mugabe, Sea Urchin, South Africa, Sunday, Tanzania, UCT, Zanzibar, Zimbabwe. Bookmark the permalink.